Submitted by lynn on Wednesday, July 18, 2018 - 10:05am. Did you know it's National Caviar Day?! 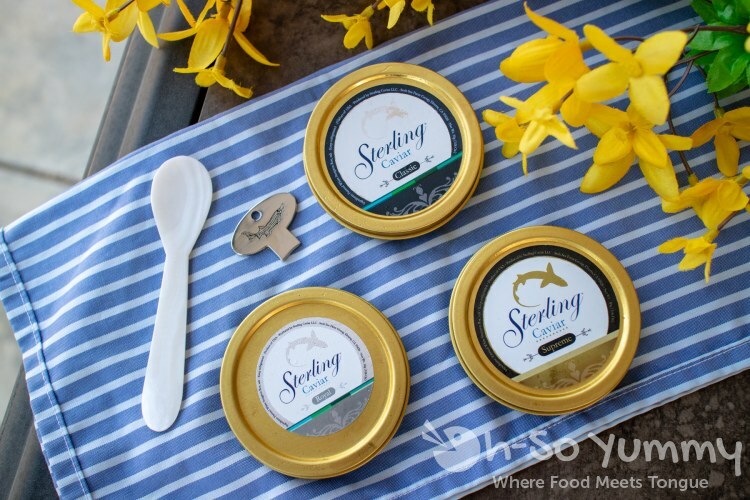 Sterling Caviar is the leading producer of domestic caviar and they provided us with a caviar sampler pack. 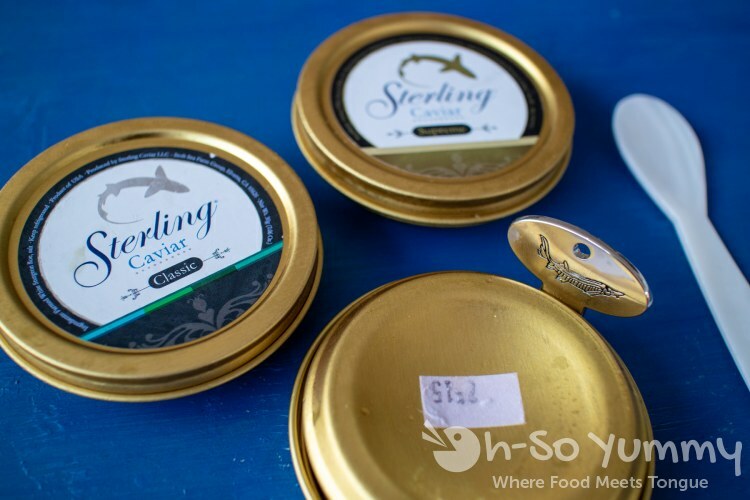 I also attended an informative facebook live with Sterling Caviar that taught me about the sustainably-farmed sturgeon that produces the caviar. You can see the replay on facebook here. 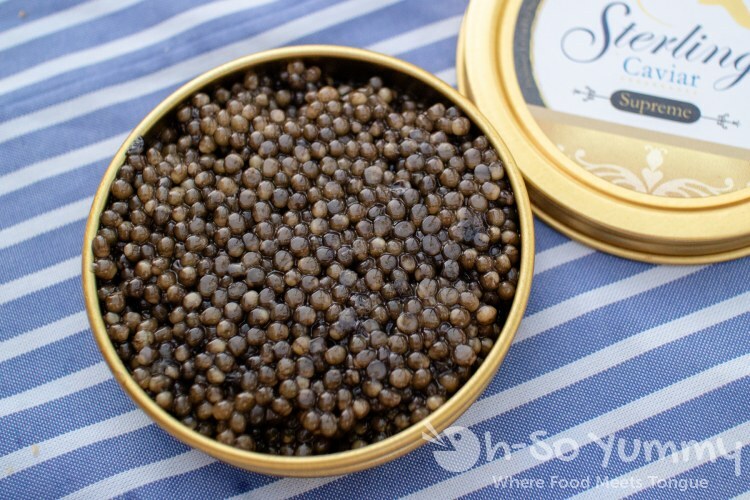 True caviar comes from sturgeon eggs and anything else must be prefixed with the source, such as salmon caviar, rather than just saying caviar! Also, scroll down to the bottom for a 20% discount code following the review. I did some additional research to help familiarize myself with caviar. First lesson was how to care for the eggs prior to the tasting. These are placed in the coldest part of your refrigerator and I used ice packs to keep them chilled. You DO NOT freeze your caviar! Second, metal utensils are not recommended because it alters the perception of the taste buds in your mouth! The sampler pack included a mother of pearl spoon which was a neutral tool for scooping out the eggs. Here's all three tins in a single shot. The differences in color and size are very noticeable between the three! From left to right is classic, supreme, and royal. The middle supreme has the most brownish olive tones while the other two are almost irridescent black. The classic is the smallest in diameter while the other two are bigger. Per their site, 15 grams is typically enough for one person. 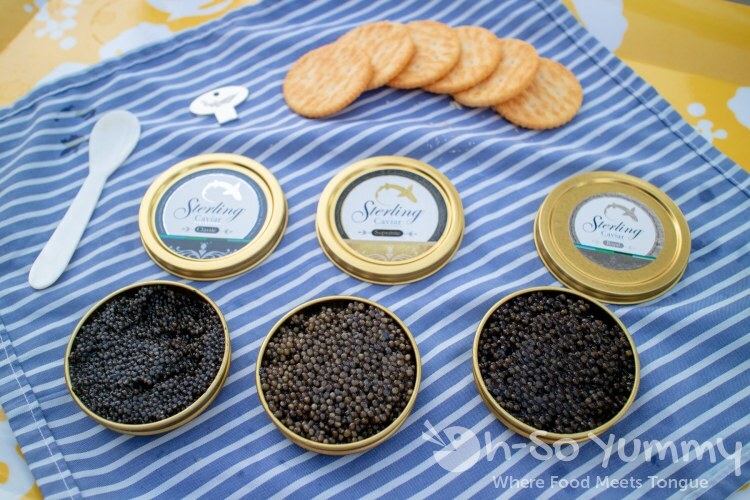 With a set of three 30 gram tins, I extended the caviar tasting to some friends during a potluck. We started with the classic caviar first. And to be clear, I did have a taste which caused that top right dip. This caviar was the tiniest size, around the 2-3mm size. These little acrobats rolled around in your mouth, making it a little harder to pop onto your tongue for tasting. The first few thoughts were fishy, salty, and a little oily, but in a good way. Moving forward, the royal grade was next. These eggs were larger, closer to the 3-4mm size. Immediately we could taste a difference between the first and second. This one had more of a fresh seawater taste to it and moved to the top of the approval ladder. With the bigger size, the smooth and silky eggs were easier to crush in your mouth to extract that caviar flavor. We were down to the last tin, the supreme grade. These eggs had a beautiful brownish olive tint, much lighter than the other two. They were also around the same size as the second sample. Once again, these were more on the fishy, salty, a little oilier side but stood out as the favorite of the group. This was definitely an eye-opening experience for me as well as my friends. Most had never eaten caviar before and were introduced in a very informative way! The included tasting guide really helped them look for caviar characteristics during the tasting. The sample pack was plenty for our little group. 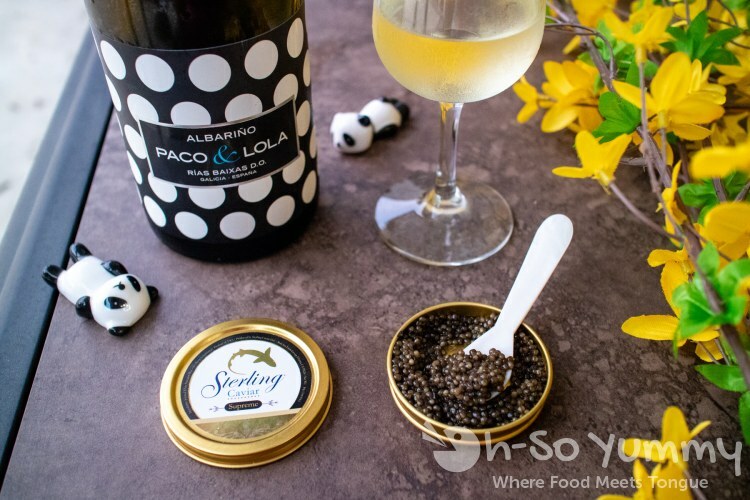 The Sterling Caviar website recommends an Albarino if you want to pair with wine. This is a high-quality, light-bodied white that grows mostly in Spain and Portugal. It’s loved for its high acidity, refreshing citrus flavors, dry taste, and subtle saltiness, plus it pairs well with seafood dishes. Another popular alcohol pairing option is Russian vodka, but that's a bit strong for my tastes! We sampled the caviar with Lay's potato chips and Ritz crackers but other pairing options are toast points, blinis, and crème fraîche. 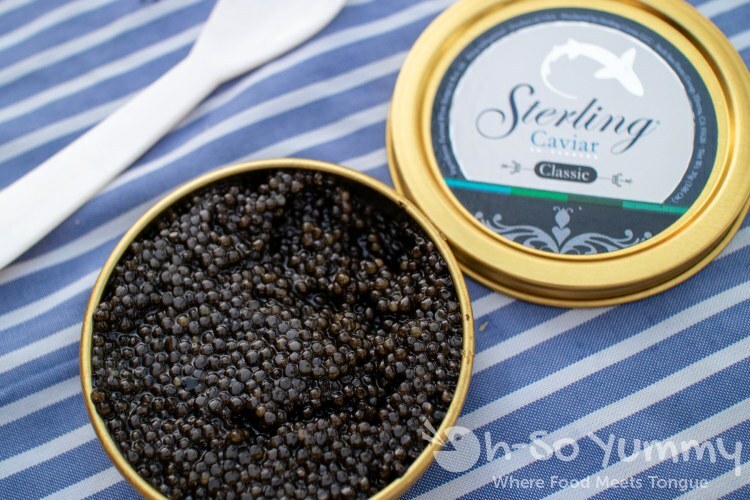 The Sterling Caviar website also includes two recipes if you want to go that route! If you want to test the waters on caviar, check out your fresh sourced seafood restaurants for a taste. 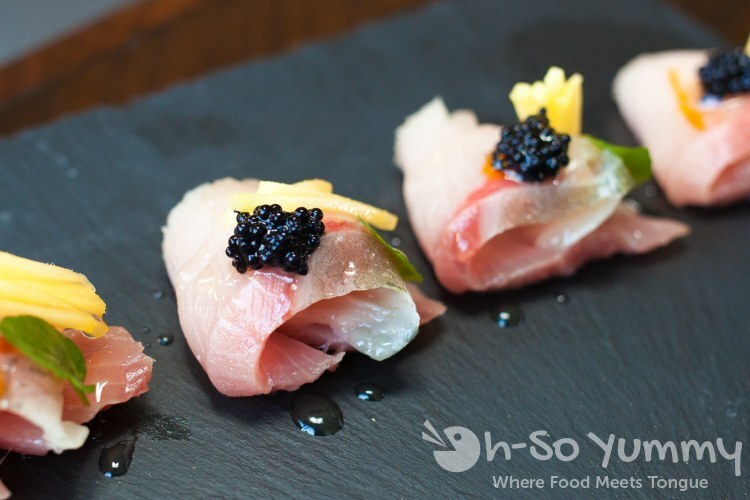 Our local Fishmonger's Market offered a few options with a caviar accent such as this gorgeous hamachi crudo (pictured above). I attended a chef celebration dinner last year at Arterra which including a seafood dish with caviar as well. Even my family has tried it when the father-in-law purchased some for the grandparent's birthday! 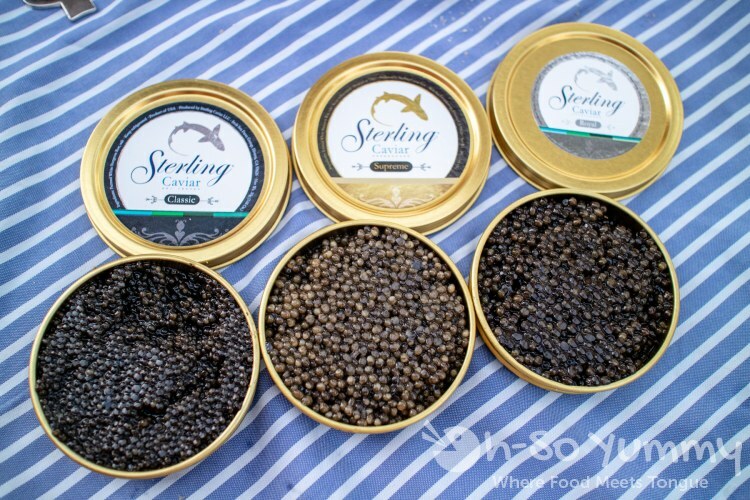 Sterling Caviar would be a great source for enjoying caviar at home for a special occasion. All of the caviar I tried is available on their website for purchase: https://www.sterlingcaviar.com/. Have you tried caviar and what did you think? I do like it in small doses. I think the 30 gram tin is plenty for a small group to sample. I don't see myself eating half of that container per the recommended servings! I'm not a huge fan of caviar but Mr. SBF is. Maybe I'll surprise him with a special treat! a little treat here or there is always nice! Great informative post about caviar. Tasted years ago. Not crazy about it but is one of those foods you have to try in your lifetime. typically i wouldn't eat things that are on the salty side but i don't mind it as an accent to foods. it was definitely worth trying multiple "styles" in one tasting. 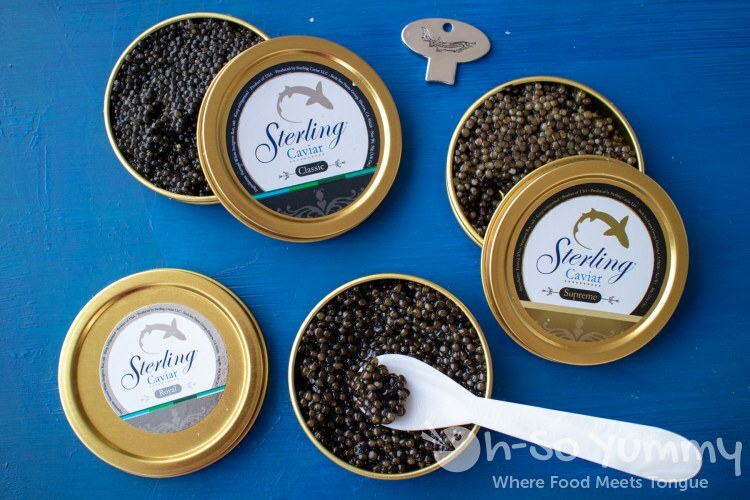 Seems like Sterling are "emulating" the classic Russian Sevruga, Osetra and Beluga caviar in size, color and taste profile, without explicitly calling it that (instead, Classic, Royal, Supreme). Do you know why? Hi W. Scott! To be honest with you, our grade names of Classic, Royal, Supreme, and Imperial are arbitrary and not meant to "emulate" Sevruga, Osetra (or Russian Sturgeon/Acipenser gueldenstaedtii), or Beluga. Unlike many other sturgeon species, the roe of white sturgeon has a natural variability with regards to color, texture, and egg size which is why we feel grading is necessary. 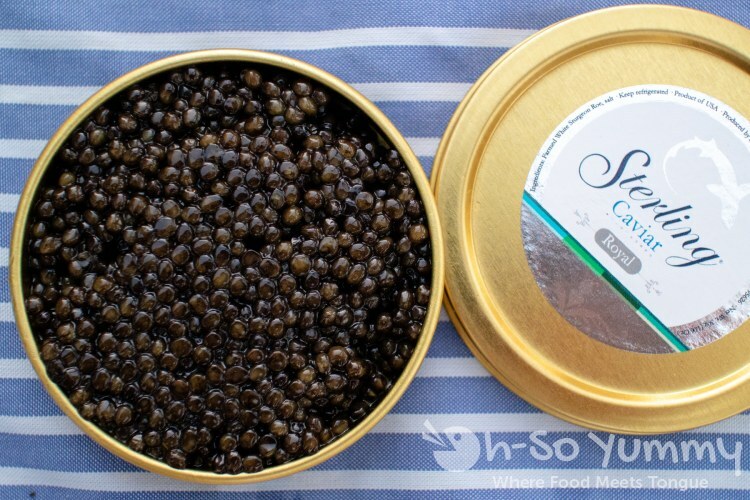 With regards to texture and taste, our white sturgeon caviar has been most closely compared to Osetra from Russian sturgeon/Acipenser gueldenstaedtii. it was a surprise how they tasted by themselves. i wonder how it would have paired with some of the other traditional pairings too. i like the creative dishes.